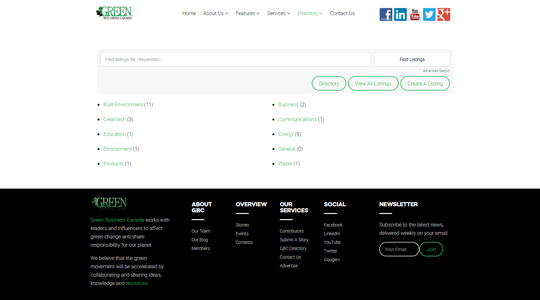 Green Business Canada is a non-partisan, non-political organization devoted to helping Canadians share ideas and initiatives promoting green concepts and environmentally friendly business objectives. 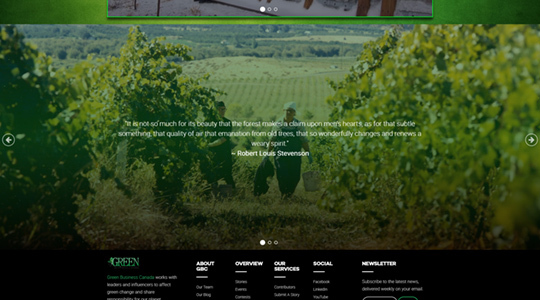 Alchemy Imageworks web designers were tasked with creating an eco-friendly visual impression wrapped around a powerful blogging platform to bring green businesses, news, and concepts together under one virtual roof. 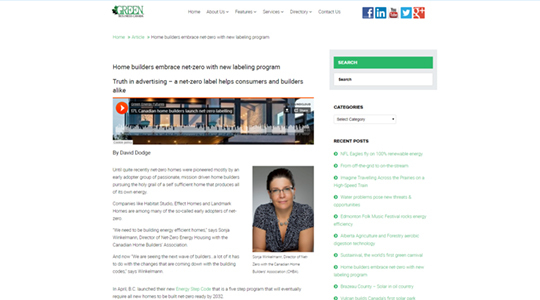 We implemented a WordPress website solution that met every requirement and that provided the managing partners and editorial contributors an easy-to-use platform to get their message to the world. Fun Fact: Alchemy Imagework’s founder, Kelly Eros, is also an active partner in Green Business Canada, working with industry leaders and influencers to encourage and affect green change and responsibility for our planet. 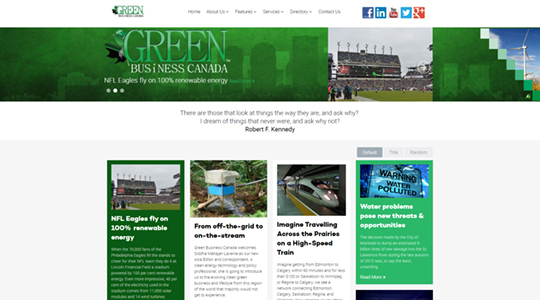 Enabling the editorial contributors and managing staff of Green Business Canada to upload, edit and moderate their own website content was of paramount importance. With any magazine, news or well, any website for that matter; content is king. The survival and evolution of any great news or media website is based largely on the continuous supply of original and search-relevant content. Journalistic linking, proper article formatting, tagging and social media sharing options are vital as well. While the initial development and impression is important, it’s also crucial to maintaining momentum post-launch through consistent content injection, effective cross-promotion, highlighting of contributors and collaborative filtration to ensure readers get a personalized reading experience worthy of returning. Sponsorship marketing material placement and updating can be a painstaking task with customized HTML/PHP websites, but CMS website development offers several inexpensive to purchase and relatively easy-to-configure plugin-in utilities to make advertising management on your business website an affordable, if not enjoyable experience. Contact us today, and ask how we can help you integrate a full-featured online advertising platform into your business website strategy. Video content access makes up a significant portion of internet traffic, estimated to breach 80% by 2019. The popularity of video for use in advertising and marketing has seen a dramatic increase in the past decade as well, with an estimated $7.77 Billion spent on video advertising in 2015 alone, and that number was predicted to double within 4 years…. it’s already exceeding expectations. The reason for the rapid growth of video advertising and content creation for video advertising has been its effectiveness. If a picture is worth a thousand words, a video is worth a thousand times more. Great video production no longer requires a six-figure income, and the lower cost is making video advertising and the creation of original content that much more accessible. Video content can benefit search engine optimization (SEO) greatly, and analytics can provide incredible insights into demographic behavior that can help steer a business or marketing strategy on the correct course to success. If you’re interested in website video integration or applying video content development to your online marketing strategy, please feel free to contact us or request a free estimate. I've worked with Alchemy (Kelly), throughout my live project recording. Anything I needed from grand images on stage to posters, cards, and banners for sponsors, updating my computer network for my site, Facebook, Twitter, announcements and a lot of my computer tech problems were addressed and fulfilled wonderfully!! I'll continue with them because there doesn't seem to be anything that I ask of them that they can't do!!! I've worked together with Alchemy Imageworks on a few projects. They are passionate about the work they do, and settle for nothing but the best for their clients. I look forward to working with them again in the future. I was looking a new design for my website and a new logo to along with it. Alchemy Imageworks delivered in a big way. My website looks amazing I've had nothing but compliments on how spectacular it looks. My website is way beyond what I expected and I couldn't be any happier. Kelly and his team also did a fantastic job on my logo.